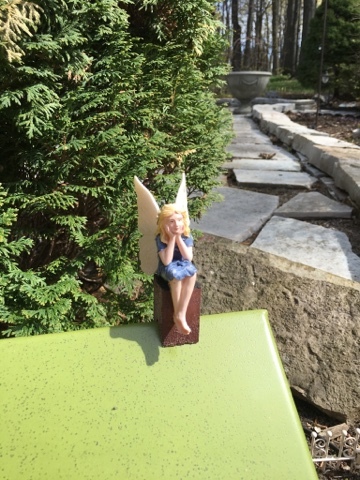 (Infuse With Liz) and (Sit With Me In My Garden) into one new blog. 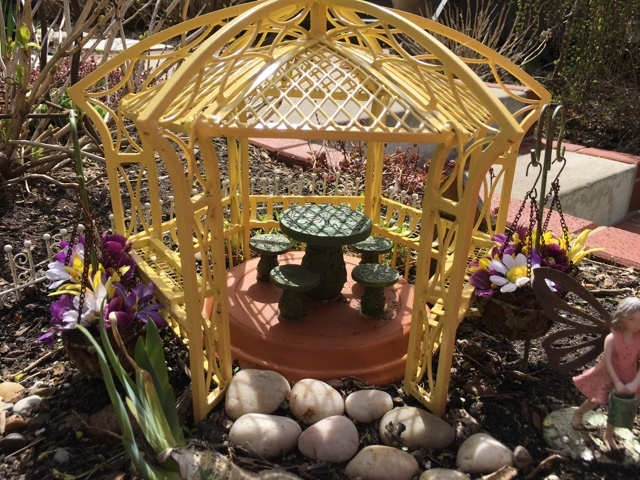 All the garden posts from this blog have been added to the new blog and can be found below the header under "Gardening"
"Home and Gardening With Liz"
I truly hope you will continue to follow me. It's becoming more beautiful each day and feeling more and more like summer. The trees have been shedding their seeds and pollen and it's been very messy! The giant Sum and Substance hosta is huge and the Empress Wu to the rear is getting larger each year. Something (likely a deer) chewed off part of it so it would have been even larger. The hostas are still filling out so they'll be getting larger yet. I went with red this year as my predominant color. 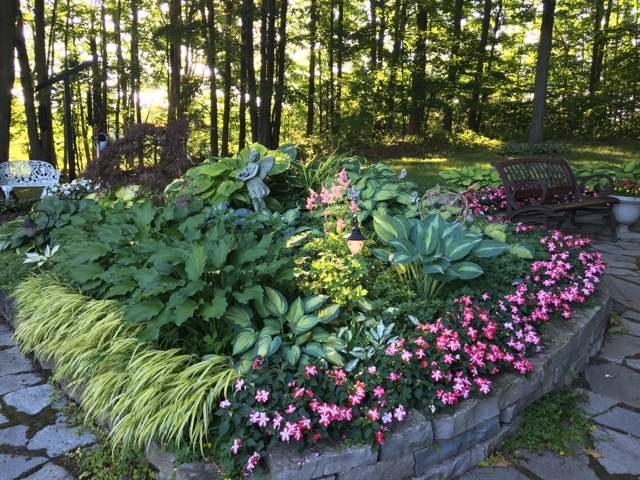 I just got the border planted around the fountain area. It's going to look great once the plants start to fill in more. I also chose a lot of other colors for my planters. I wanted to be surrounded with a lot of color. This is a path area to the rest of the back yard and it was being overtaken by the Sweet Woodruff plant. This morning I removed a bunch of it to open the path back up. The Sweet Woodruff has a hairy root system that sends off runners but it's not real hard to remove. The roots are not real deep and pull away easily enough. I like how it fills in and softens things. Further out back a big ash tree fell and got hung up on some maple trees. It's at least 50 ft. tall and now we have to decide on whether and how to remove it. By the deck I planted a Sarah Bernhardt Peony (which I don't think is going to bloom this year), two Pink Columbine plants and further down some Cleome. I call this my pink garden area! The Dutch Iris are coming on strong so it won't be long before they're blooming. I bought some Variegated Sweet Iris and planted two of them out front on the island. I think they compliment the blue spruce tree and the hostas. There are two milkweed plants that jumped in by the daylilies. I'll leave them since we are all trying to be more conscious about the Monarch Butterfly's needs (although I may regret it in my garden). Orange Marmalade Hosta- has been slow for me but this year it looks really good. I credit the easier winter that we had for most everything looking good this year. I found some peony cages and the Peonies are doing quite well with them. The third one you can barely see is to the left and almost eaten by the Blue Spruce. I keep saying the spruce is done getting wider, but each year it continues to widen out! 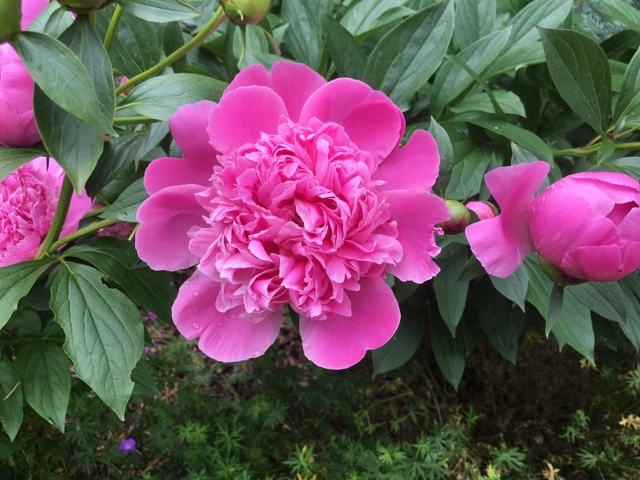 I really have to move that peony this fall. They all have flower heads so it won't be long before I can enjoy them! The columbines are blooming now. The big blue spruce is moving in on them too! Dan suggested we may have to open up the bed again and move the plants. I would love to do it although it's a huge task. We shall see! I had Dan remove two Yew shrubs from the front area of the house. I have been changing this area up for a few years. I have some older Arborvitae (cedars) I want to yank out too that are around the corner. We put in a Minnesota Snowflake Mocorange. It's not supposed to get larger than 5 to 8 ft. tall and the same for width. It has buds all over it so I can't wait to smell it. We're looking at hiring some strong young men to clean out all the lava we put in there 20+ years ago. 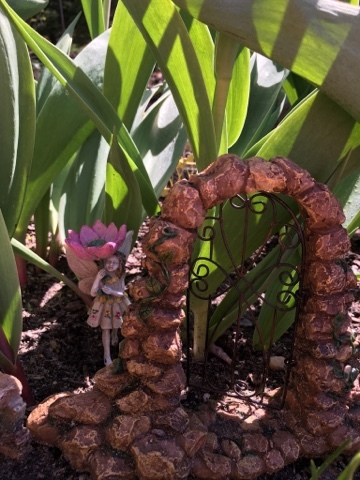 A couple of quick shots of the fairy garden. It's in slow motion so I won't show it all yet. 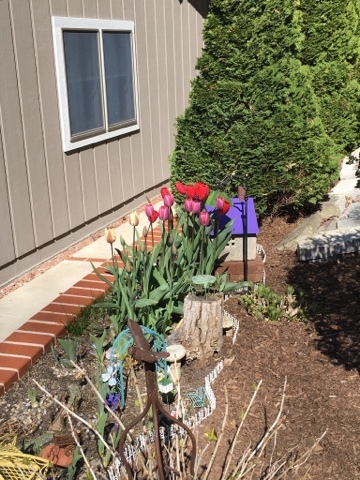 Still waiting for the tulip plants to die back a bit so I can shear off the plants and finish the fairy garden. See the little purple viola to the left. It came back from last year and I relocated it back there. I just love their sweet little faces! These are some Pansiolas I put in. It's a new crossbred pansy and viola that are supposed to be more heat tolerant, don't need dead heading and should bloom all summer. We shall see! A lot of my annual plants quit blooming because of the stretched out cool spring weather we have had but they should be blooming soon! A quick picture of the back area. Things are steadily filling out. The lilac topiary is about to flower too- can't wait since this one smells divine! As soon as my other annuals start flowering better I'll show you my planters. Thank you as always for your visits! 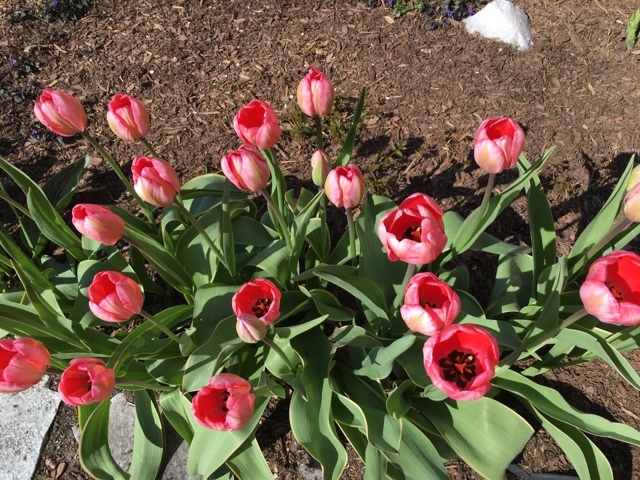 It seems like it took forever but the tulips are finally in full bloom! We dressed the beds with cedar mulch last weekend so everything looks real tidy! I'm quite fond of this one which is called "Design Impression"
This is how it was described: Deep green foliage with narrow lime-yellow margins. Large flower of radiant rose and muted golden flushes. 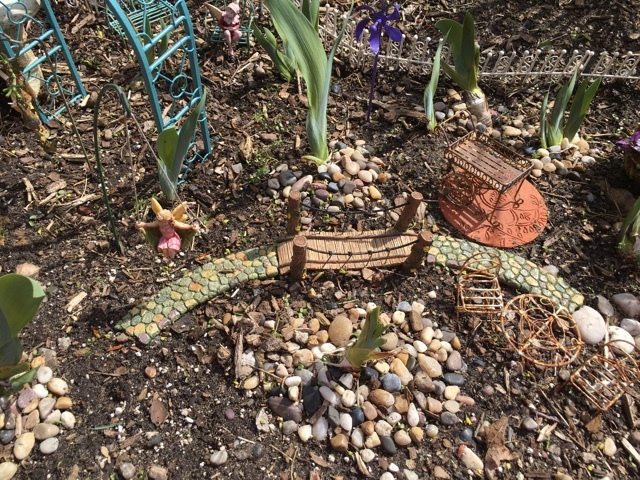 A quick view including the fairy garden area. The newly painted fence shows up much better now. 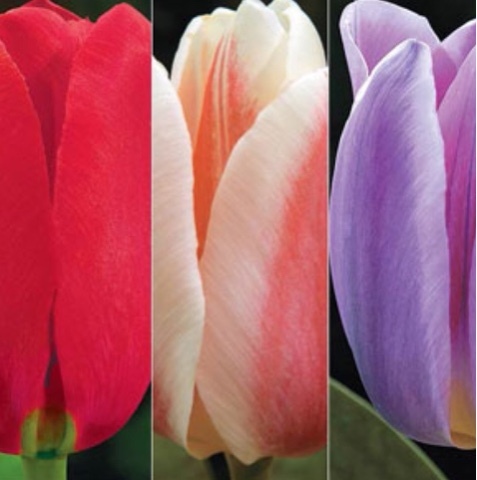 This is the picture of the tulips below from the Breck's catalog I ordered from. The red is spot on but the purple is more of a fuchsia and the soft pink is marginally close. Either way I like these tulips and how sturdy they are. 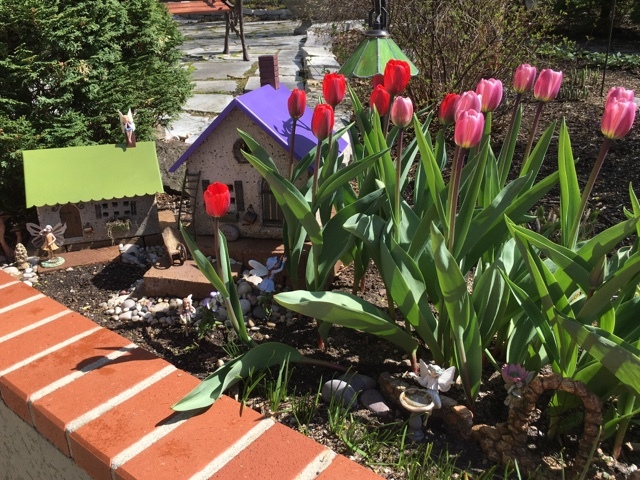 Loving my little "tulip time"
The faires have come out to start working in the gardens. 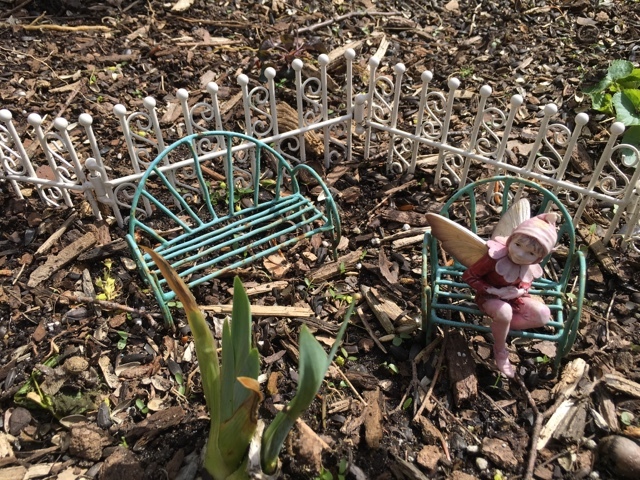 The "Tulip Forest" is blooming and now the fairies are checking out what needs to be done. The bird bath needs a little sprucing up! Come on through the gate and take a tour! We'll sprinkle some fairy dust on you to shrink you to size! She's always climbing up on things to see what's going on! Taking a break viewing the scenery! This one's wondering how big the iris will get! The fence got a new paint job and now it shows up better. The gazebo also got a new paint job. 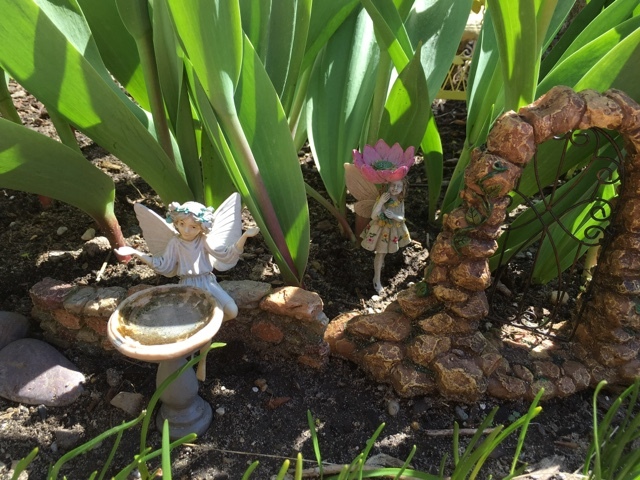 I want lots of colorful things in the fairy garden this year. A new table and chair set are residing on an upside down clay tray. I glued them down so the critters won't be messing them up! 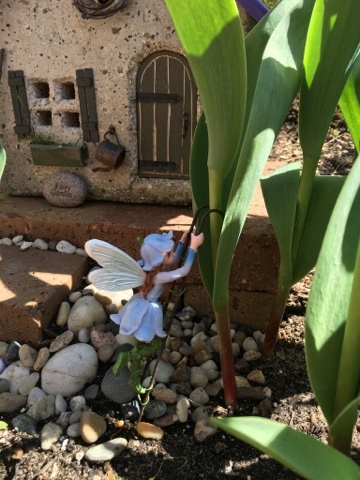 Last year I split up some iris and planted them in the fairy garden area along with tulips. Now I have to figure out how to make it all work! The challlenge of it all will be the fun part. The first dining table set I got for the fairy garden is sitting to the right also needs a paint job too rusted for me! 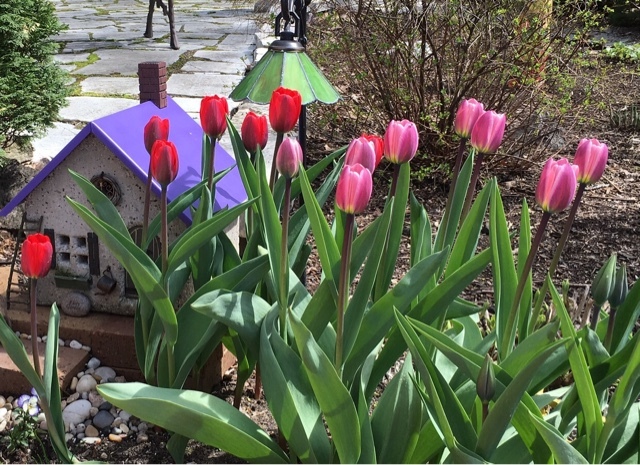 Some of my tulips by the granite bird bath were eaten below the ground. I read up on it and it could be chipmunks or voles. Not happy about it but it's nature and there's just so much I can control! 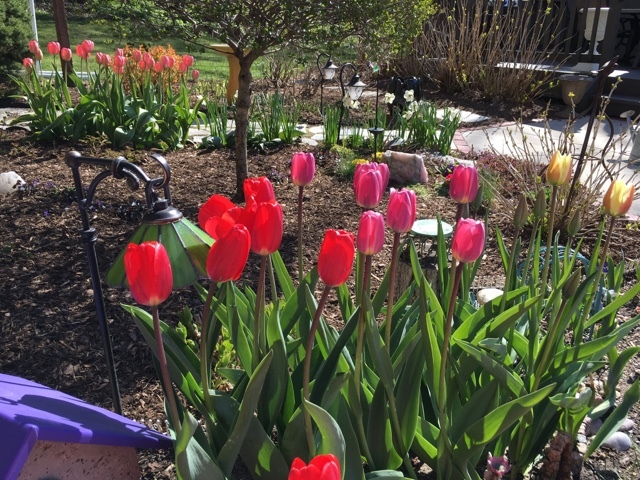 I'm just so darn happy it's spring and time to plant flowers and enjoy, enjoy, enjoy! 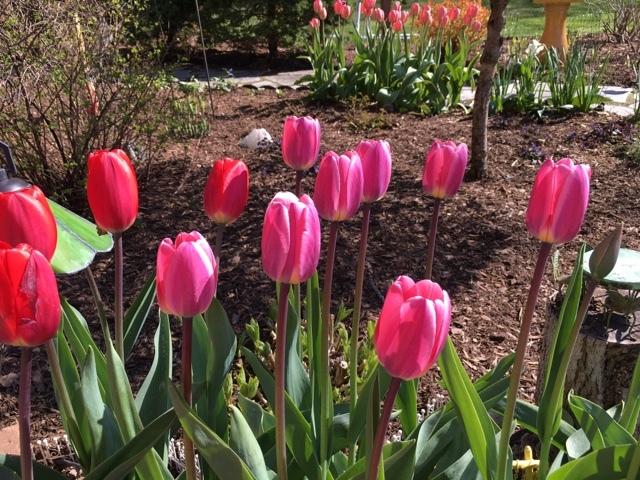 Spring has been slow to get going here but we are seeing flowers and shrubs blooming so that's a good thing! I love this Primrose plant. It will continue to get larger and have more leaves as it warms up. We're still dipping down in the low 30's at night so the plants are slow to come alive. The Pachysandra (Japanese Spurge) is another reliable plant here. This is my hosta hill as I call it but so far the hostas are barely out of the ground. This area was loaded with oak leaves but I got Dan to use the leaf blower to clear them out early. A few stragglers are still around. They're flowering right now. Nothing real exciting but still a welcome sight! It's hard to imagine that before long it will look like this again! It's been raining for several days on and off. Sorry the path looks messy but the old mulch pieces seem to find their way onto the stones when it rains. 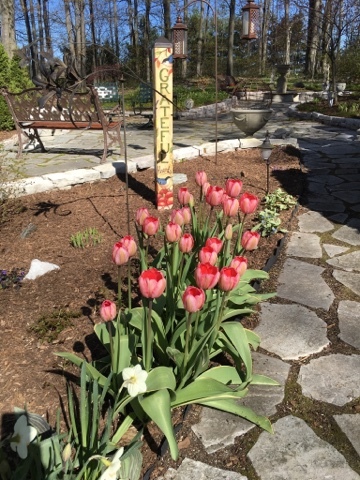 Anyway, some daffodils and tulips are making their way up and should be blooming soon. This is the same path area but I removed the hostas that are up close here and relocated them last fall. Right now the new tulips are coming up in that same area. Last weekend it was so nice out I had to get outdoors and do something. I started bringing out some of my planters and accessories. The art post is a new piece (gifted at Christmas) for the garden. Each side has a different design. This is the same general area from last summer. This reminds me I need to get out my hummingbird garden accent! 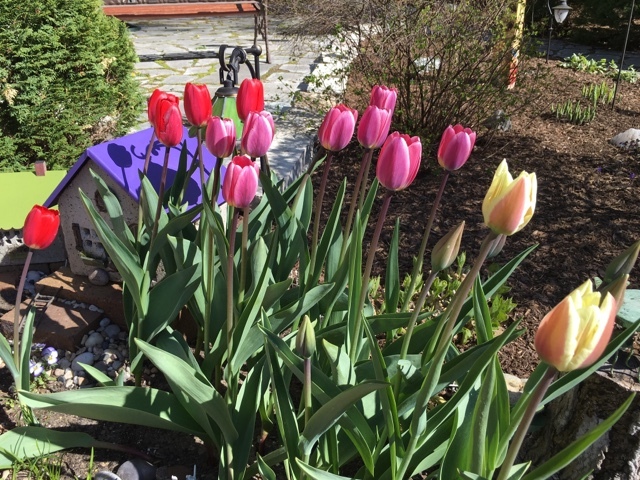 I can hardly wait to plant flowers and enjoy the upcoming summer season! May is when things really get a move on here and then watch out!! An early summer view from the deck last year. There are some daffodils blooming around town and so are the forsythias. I took this snapshot by a restaurant. I like how the dried grass looked near them. How's it going in your area? I trust you all had a great Christmas and are ready to bring in the New Year! I always find it rewarding to have a few live plants around especially during the winter months. I love the color red and use it a lot with my Christmas decorating but I chose a white poinsettia to break up the color scheme a bit. 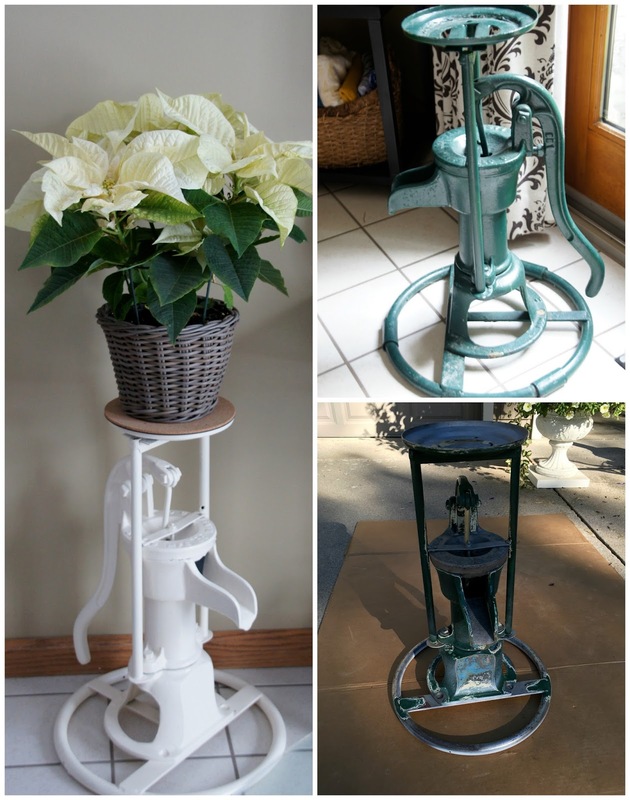 I've got it sitting on this old water-pump plant-stand my husband's father made for his mom many years ago. Dan stripped it down last summer and I had him paint it a creamy white. I planted three amaryllis bulbs the first of November. By December 9 this is where they were at. Of course in my ridiculous imagination I dreamt all of the flowers would grow at an even pace and I'd have a fantastic display! Instead I will have a progressive display that will no doubt last a month. We had to leave for a few days for Christmas and it was nearly open. When we arrived back home I was greeted by this! I think they are the prettiest Amaryllis I have ever grown. These are called "Barbados"
Next year I'm thinking of growing them in tall glass cylinders to the plant will be better supported. I think I'll mix a little soil with stones for the roots to grow in. I am told they don't like to stay wet for long periods so it will be a delicate balance. I was inspired by these amaryllis growing in glass cylinders that I saw at Terrain while we visited in Pennsylvania. These bulbs were encapsulated with a vinyl like covering and didn't need to be watered. I didn't get a close up picture of the bulb though. I think this is smart- especially for people working in offices or who have poor luck growing things. Just watch it grow! My "Thanksgiving Cactus" which I always refer to as my Christmas Cactus is also blooming but it looks like the bloom time will be stretched out from one side then the other. It's a good thing since it extends the time I can enjoy it. We had such a wonderful long autumn and were gliding along so happily but then winter weather came in with a bang! It warmed up for a week after I took this picture and some of it melted down but now we're in the deep freeze again! Tis' the season! Wishing you a very Happy New Year full of great moments!